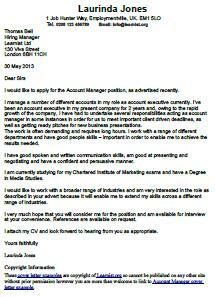 Cover letter example for a Account Manager job in the UK. Amend as suitable and start making your own cover letter and apply for jobs. I would like to apply for the Account Manager position, as advertised recently. I manage a number of different accounts in my role as account executive currently. I’ve been an account executive in my present company for 2 years and, owing to the rapid growth of the company, I have had to undertake several responsibilities acting as account manager in some instances in order for us to meet important client driven deadlines, as well as getting ready pitches for new business presentations. The work is often demanding and requires long hours. I work with a range of different departments and have good people skills – important in order to enable me to achieve the results needed. I have good spoken and written communication skills, am good at presenting and negotiating and have a confident and persuasive manner. I am currently studying for my Chartered Institute of Marketing exams and have a Degree in Media Studies. I would like to work with a broader range of industries and am very interested in the role as described in your advert because it will enable me to extend my skills across a different range of industries. I very much hope that you will consider me for the position and am available for interview at your convenience. References are available on request.